This Article will explain how they spy on you and how you can stop Microsoft from getting your IP Address without your permission. 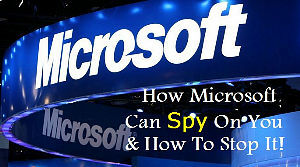 How Microsoft Can Spy On You? The answer is simple, via their NCSI ( Network Connectivity Status Indicator ). Why should we care of it? Well… each time we start our Windows Computer an Internet connection test is run automatically to test the Internet availability. Microsoft admitted that they DO NOT NOTIFY the user Before attempting to collect informations, infact it is automatically done if you have the Internet!.